With assets of over $3.5 trillion BlackRock bestrides the global investment industry. With over $115 billion in alternative investments, BlackRock finds itself among the leading tier of firms that have developed since the sector took off in the early 1980s. But it was the acquisition of Barclays Global Investments in 2009 that took BlackRock to the top table of hedge fund operators. In mid-2011 it is managing over $54 billion across single manager hedge funds ($29 billion), fund of hedge funds ($20 billion) and UCITS funds ($5 billion). Even allowing for fluctuations in assets under management among the leading hedge fund groups, BlackRock is comfortably holding down third place by assets under management in the wake of hedge fund industry leader Bridgewater ($90 billion) and the number two player Man Group ($69 billion). Getting to see BlackRock proved far from straightforward. A request earlier this year to interview Mark Lyttleton and Nick Osbourne, managers of the UCITS sector leading BlackRock UK Absolute Alpha ($3.5 billion AUM) was flatly turned down. Though it is a long/short equity vehicle, BlackRock has assiduously (and visibly) marketed the fund to retail investor channels and was distinctly cold on it being analysed as a hedge fund. But in May, Matthew Botein, who became Managing Director and head of BlackRock Alternative Investors when it was carved out of the group in mid-2010, agreed to an interview on a lightening quick investor road show to Europe. 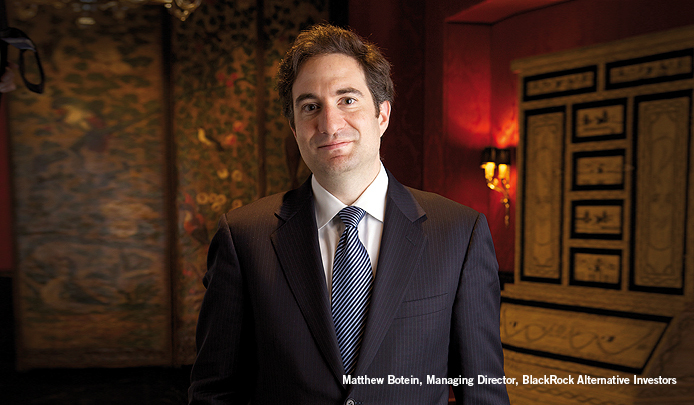 “The good news is that everyone is happy to get together and talk about alternative investment strategies right now,” says Botein, who at 38 offers a youthful vitality that goes along with an impressive record of achievement. “It is not an unreceptive audience. The bad news: it was all in one week.” Giving every impression of being the happy corporate road warrior, Botein whizzed through investor meetings in London, Copenhagen, Stockholm and Amsterdam. Though Botein says he struggled with the darkness on a previous winter visit in northern Europe this tour occurred in the lengthening days of spring. The preference for light extends easily enough to transparency, which is a major factor in institutional investors’ growing allocations to the compliance-heavy investment platforms that are the hallmark of mega asset managers like BlackRock. BlackRock, as a leading investor in alternative funds, notably funds of hedge funds, is a keen advocate of greater transparency. With regulators pushing fund managers to provide investors with better information about what they own, firms like BlackRock will be well served by improved reporting standards and better clarity on risk exposures. Botein, for his part, is also positive about the Alternative Investment Fund Managers Directive and mindful about how regulation is evolving differently in Europe, the US and Asia. Like other alternative funds managers, BlackRock finds comfort in the big picture enveloping the reforms. Improving market processes and more close structuring of the relationship between fund managers and investors means that institutional allocators will be able to become more comfortable with the wide range of alternative funds, including hedge funds. In turn, this should help more assets flow to alternative funds. Botein’s youthfulness in the flesh belies some big time experience. Before joining Blackrock as head of the special situations group he was chairman of his own private investment firm, Botein & Co. LLC, and from 2003 to 2009 he served as an analyst and then managing director of Highfields, a value-oriented Boston-based institutional investment manager. Before that Botein cut his teeth with a three year stint working as a private equity principal at Blackstone where he gravitated after excelling in AB and then MBA degrees at Harvard. He is currently vice chairman of Private National Mortgage Acceptance Company, a vehicle created by BlackRock and Highfields to channel long-term finance to the US mortgage sector. He also sits on the boards of other public companies (First American Corp. and Aspen Insurance Holdings Ltd.) and is involved with various private and philanthropic organisations. Coming to BlackRock, saw Botein help to knit together the firm’s multi-faceted alternative investment business. It extends across numerous business lines, dozens of strategies and hundreds of funds. If diversity is the one free lunch of asset allocation, then BAI’s menu of alternative funds would seem to offer investors a vast smorgasbord from which to choose. Within BAI, the hedge fund business, including funds of funds and UCITS, account for nearly half of the AUM. Combining such large scale in both the fund of funds arm and the single manger business is a relative rarity in the hedge fund industry. The base of BlackRock Alternative Advisors, which comprises the hedge fund of funds business, is Quellos Group, acquired in 2007. Bryan White, a co-founder of Quellos and chief investment officer, became managing director of BAA, bringing a two decade track record in manager selection and operational due diligence. The network of fund managers includes a current group of over 100 that BlackRock is invested with. There is also a historical database of two decades of interaction with portfolio managers, tracking movements and performance. On top of this, there is a due diligence process of people and strategies that has evolved considerably in response to changing investment and market conditions. A key part of the strength of the fund of funds proposition is transparency. Over 80% of the underlying positions in which BAA invests display position level transparency. This helps both risk management and aids portfolio optimisation, though BlackRock is careful to screen this from its direct hedge fund investing and other investing businesses. Given BlackRock’s scale with many managers, it can often customise an allocation to a fund of funds manager. This could give an improvement on commercial terms or it might be to get an opportunity to invest in individual strategies or the sub-strategies of a manager – areas where an individual investor might not have the clout or a sufficient level of capital to have the same impact. Though funds of funds have yet to fully recover from the liquidity and performance problems they exhibited during 2008-2010, the need among institutional investors for the service is palpable. Like other providers, BlackRock is seeing investors use funds of funds as part of a much broader alternatives solution. Direct investment will occur after enough diligence work has taken place, but there is still a need among some allocators to put to work a larger proportion of their portfolio more quickly in liquid alpha opportunities that provide needed diversification and enhancement to direct allocations. Kroner migrated to BlackRock with the takeover of BGI, which he joined in 1994 after doing a PhD in economics at the University of California (San Diego) and teaching economics and finance at the University of Arizona. At BGI, he ran global market strategies, co-headed client solutions and headed the Hedge Fund Management Group. These teams oversaw BGI’s asset allocation, global macro, currency, active commodity and funds of hedge funds investing. A certain dualism is apparent in the thinking among hedge fund investors in 2011, according to Kroner. “Investors are very clearly showing their preference for managers that have the ability to have a very robust infrastructure that backs up investment professionals that have a lot of autonomy,” he says. Kroner attributes this to the phenomenon of big, institutional type hedge funds growing assets healthily while smaller and newer firms struggle to attract capital. Building the hedge fund business shows BlackRock’s healthy appetite for acquisition, something underlined by the deals for BGI and Quellos. That is a natural evolution given BlackRock’s spin out form Blackstone by continuing CEO and Chairman Larry Fink, who took the business independent in 1992. Along the way, transactions helped open new doors or broaden existing product offerings. BlackRock, for example, was quite active in fixed income oriented investment strategies. But it reached out to acquire businesses from Merrill Lynch which operated in hedge funds in the fundamental equities area focused on certain geographic regions and certain industries. The acquisition of State Street Research added additional capabilities in the fundamental equities area. More recently, the integration of BGI brought both equity and fixed income quantitative long/short investment capabilities to the firm. For an example of how the different investment businesses in BAI can feed off each other consider a potential hedge fund investor’s interest in the renewable energy sector. Across BlackRock there are long only and hedge fund analysts covering traditional energy sources like gas, petroleum and nuclear. There are also analysts who work in commodities funds who analyse the underlying commodities in terms of supply and demand, and market trends. Finally, BlackRock also has a team that manages a renewable energy fund which is engaged in long term investments to build power projects. The ability to tap this knowledge and experience across numerous investment areas underpins the logic of knitting the BAI into a unified entity under Botein. Just as renewable power is an important new focus for BlackRock, the firm has also developed a number of investable hedge fund themes related to agriculture and natural resources. Liquidity can be a constraining factor. A large farming operation or mine, for example, won’t fit neatly in a conventional hedge fund type vehicle. As a result, hedge fund exposure to farming and resources occurs through trading the equity and debt of companies active in the sectors. There is also active investment in a wide range of commodities through futures. BlackRock itself doesn’t have a definitive view about whether commodities exposure should be hedged or heavily directional. Botein’s view is straightforward: he thinks that both approaches can be used. What’s crucial to get right is the investment vehicle to ensure that it is appropriate for a particular form of exposure. This is particularly important with commodities and resources given the wide range of alpha generators: equity, debt, futures, currencies and physicals.